If not the first, one of the first few names that come to our mind when we think of honeymoon destinations is Maldives. This peculiar premium cluster of Islands in Asia is a very popular honeymoon destination due to obvious reasons! Serene beaches, very few people, expensive private island resorts, good service, great food and wine, romantic setting, adventure water sports, coral reefs – Maldives has all the ingredients it takes to make it a honeymooner’s paradise. However, I want to point out that this destination is also a great place for family holidays! A private island resort with limited access to the outside world, plenty of activities for elders, kids and parents is a great setting for a fun and uninterrupted family holiday. 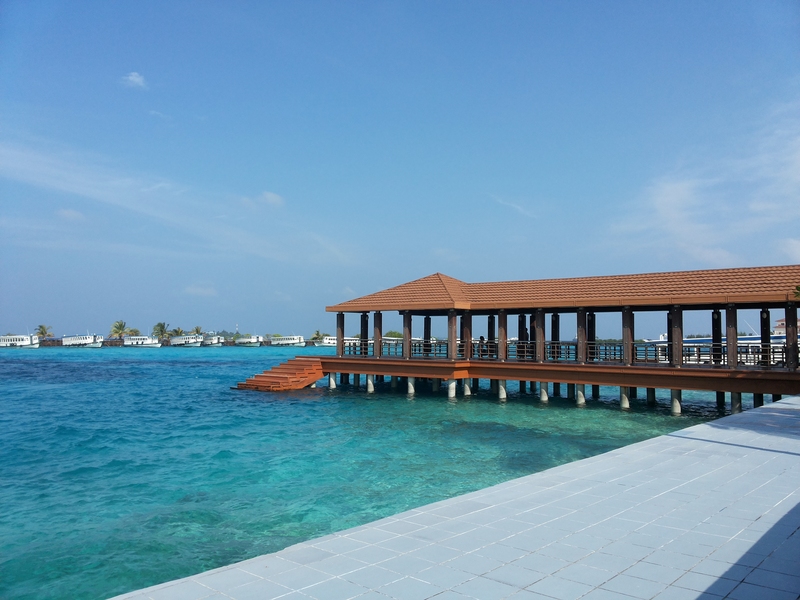 I just came back from one such holiday at Paradise Island Resort and Spa in Maldives and would love to tell you about my experience! R and I wanted to take a family holiday with our moms in February. After a long exercise of evaluating destinations and tracking costs on Tripadvisor , Kayak and Booking.com we finally zeroed in on Maldives and Paradise Island. Post an unfortunate incident of flight cancellation with SpiceJet airlines we re-booked out tickers with SriLankan Airlines using their own website (it is the cheapest). As always, I booked my hotel stay using Booking.com and secured the reservation without paying a single penny in advance. After that the hotel got in touch with us over email and confirmed costs and transfer details to the island from Male Airport. When we reached Male and stepped outside the airport to take a speed boat to our hotel the view was unbelievable! Overwhelmed by the blue sea, we started our 20 mins journey to the lovely resort. The day we reached Maldives was 14th Feb (Valentine’s Day) and the resort had a special event on the beach! R and I enjoyed our little romantic dance on the beach with the DJ playing great music while our mothers enjoyed cocktails at the bar. The next few days were packed with great food, yummy cocktails, walks on the beach, water sports, sunsets and relaxing spa treatments. I’ll let the pictures narrate this story. If you are a seafood lover you must try the crab meal at Farumathi and Grilled Prawns at Al Tromoto! Expensive but totally worth the experience. A small tip about Maldives – a full board package is always the most economical one. You can always skip meals in it and try exotic dishes in other fancy restaurants in the resort – it is still cheaper than 1/2 board or only breakfast packages. All payments can be made in USD/Euro/GBP so there is no need to change to local currency. And yes, if you have a bigger budget you can try booking the water villas- they are located right in the middle of the lagoon and are quite unique. 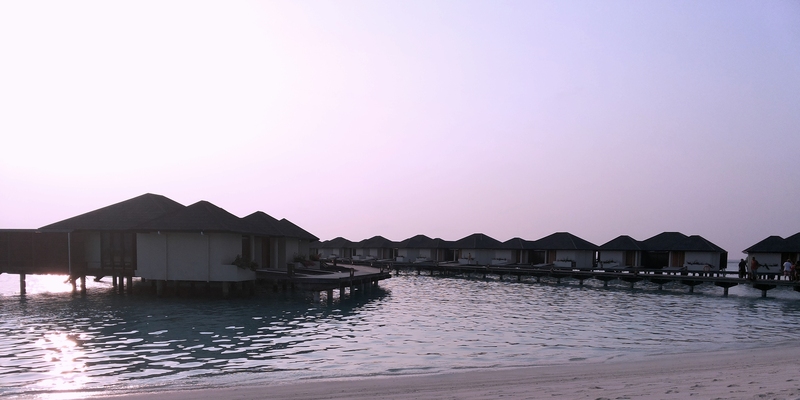 This blog by my wife capture the idyllic beauty of the Maldives. A must read.